Touchfire launched the TechArmor iPad screen protector kit, a complete set offering two anti-glare screen protectors, microfiber cloth, dust removal tape and other accessories. Touchfire, a company specializing in iPad accessories, announced an updated version of its popular screen protector. The product is compatible with all iPad models, offering high anti-glare protection and allowing users to enjoy their devices both indoors and outdoors. More information can be found at https://touchfireproducts.com/products/screen-protector-for-touchfire. Touch-sensitive screens can be quite fragile, being particularly vulnerable to scratches and dirt. Using a high-quality screen protector can significantly improve the durability of the screen while also enhancing overall user experience. From improved visibility to higher aesthetic appeal, many touchscreen device users confirm that screen protectors offer a series of important advantages in terms of both durability and comfort. The combination of scratch-resistant protection with a high-visibility matte finish makes the new Touchfire screen protector one of the most attractive models currently available, ensuring optimal screen visibility in any type of light, including interior, natural and direct sunlight. To offer users the same touch experience provided by their RETINA screen, the Touchfire protector features the TruTouch Sensitivity technology – a solution which provides high touch accuracy and smooth, natural user control. Finally, the screen protector is easy to install, being made of high-quality Japanese PET Film for convenient anti-bubble application and residue-free removal. 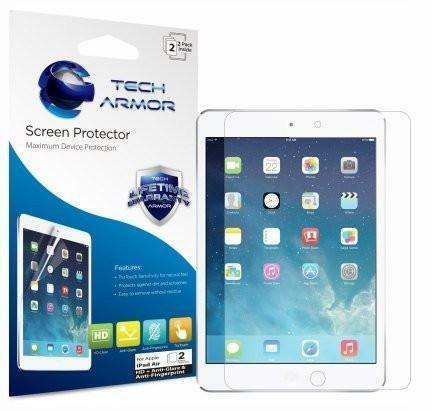 The TechArmor screen protector kit comes with two anti-glare screen protectors, complete installation instructions, smoothing card, dust removal tape, microfiber cloth and the TechArmor lifetime replacement warranty, offering users all the necessary equipment for the complete protection of their iPad screens. The latest announcement is part of Touchfire’s commitment to providing high-quality products and accessories of iPads and other devices. Founded in 2011 by Steve Isaac and Bradley Melmon, two tech experts with decades of combined experience, the company is primarily known for its highly-acclaimed iPad keyboards, as well as an assortment of storage cases, wall mounts and other products.